Amid Political Dysfunction, Beirut Residents Suffer The Stench Of Garbage : Parallels Beirut's streets are piled with two weeks' worth of uncollected trash. To many Lebanese, it's no surprise. The country has been without a president for more than a year. 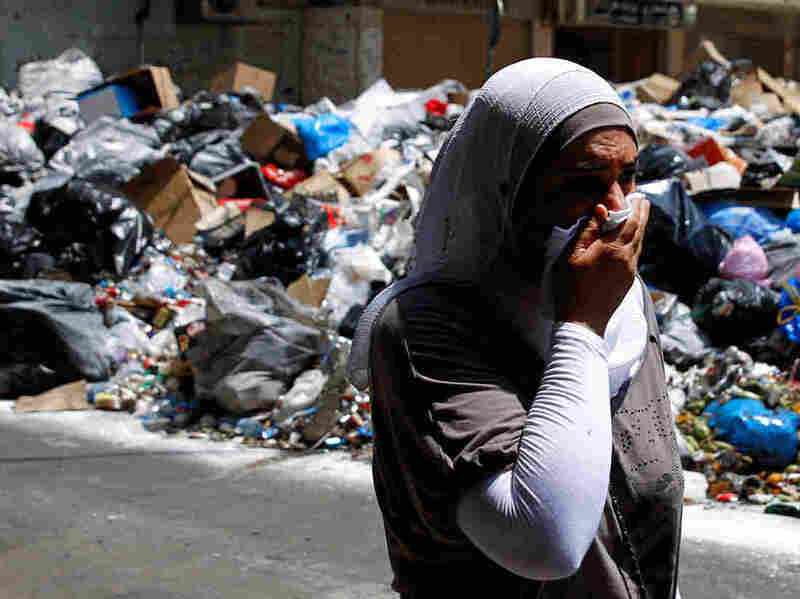 A Lebanese woman covers her nose as she walks past piles of garbage on a Beirut street. Beirut is usually one of the pleasanter places in the Middle East — a bright, cosmopolitan city squeezed between the Mediterranean Sea and a green ridge of mountains. But for the past two weeks or so, the stench from mounds of festering garbage has filled its gaudy streets. "The trash is climbing up, the mountain is getting higher and higher," says one immaculately dressed, middle-aged woman with a perfect bouffant, wrinkling her nose. She wouldn't give her name because she criticizes powerful people — Lebanon's politicians, whom she holds responsible for the garbage crisis. "I hope they will do something about this trash business, because we are suffocating," she says. "And I hope they suffocate, too." Over the years, people have grown used to muddling through in Lebanon. Electricity, water and traffic control are all intermittent at best. 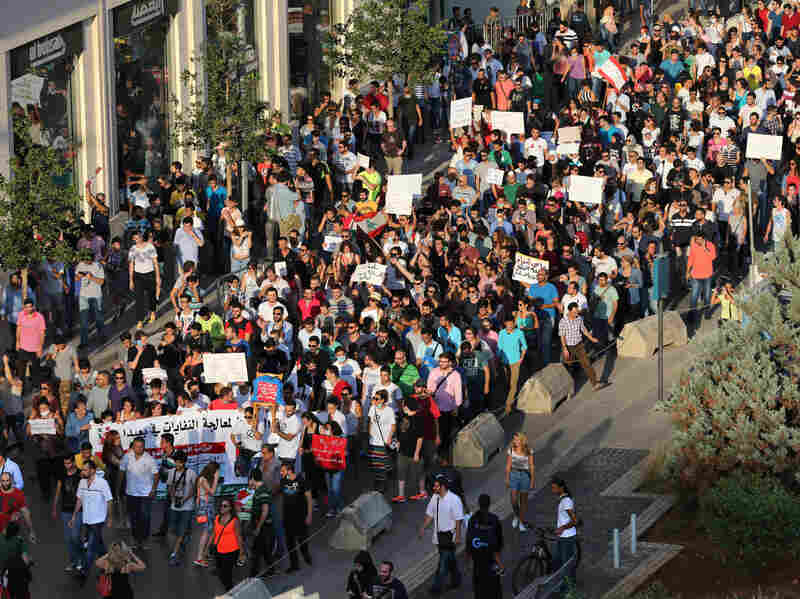 In Beirut, protesters shouted slogans last weekend against the Lebanese government for its handling of the country's ongoing trash crisis. But this summer, the trash collection abruptly stopped, and even the resilient Lebanese are upset. Face masks have become common, as have clouds of smoke as people set fire to trash mounds so big they sometimes spill over onto parked cars. Temperatures soaring over 90 degrees Fahrenheit foster the fetid stench. Angry protesters gathered outside the Grand Serail government building last weekend, some even calling for the fall of a government they describe as a "regime" — though it was democratically elected in 2009 and is headless, having failed to elect a president for more than a year. Beirut's main landfill, south of the city in a village called Naameh, has overflowed for years. It's been closed since earlier this month. But with no plan to build a new one, trash collection just stopped in the capital and the villages around it. In Roumieh village, Mayor Louis Abi Habib says when the garbage began to pile up, local officials gathered from public statements by government ministers that they were to do whatever they could to cope. "So I said, great — you know, maybe this will give us the chance to do something ourselves," he says. "Maybe in times of crisis, there is a very good time to find solutions." He mobilized his five municipal employees, and himself, to collect the village's garbage. Organic and inorganic waste are separated. Organic waste, like food, is collected four times a week (because it's smelly and attracts pests), and inorganic, like bottles and cans, once a week. A youth football team helped explain the new system to Roumieh's 3,000 residents. For now, they're keeping the garbage in two plots of land, but they're looking into composting and recycling. For all his efforts to fill the gaps in services the state should be providing, Abi Habib says the garbage is merely a symptom of bigger problems making the Lebanese angry these days. "There's a buildup of pressure on many issues," he says. "They feel like nothing is happening." Since the end of a civil war 25 years ago, Lebanon's leaders have become expert in workarounds and postponing things. Officials' terms are extended or elections postponed when no one can agree on a replacement or a new electoral law. For more than a year, Parliament members haven't even been able to choose a president. Without a president, it's difficult to pass legislation; it's a presidential responsibility to finally issue a law once it has been decided on. As of Wednesday, some garbage collection had resumed in Beirut, but residents of rural areas say it's just being dumped a bit out of the way. Sahar Atrache, an analyst with the International Crisis Group, says this sort of piecemeal approach to patch up a problem is typical of Lebanon today. "But it's not really sustainable," she says. "It's not really a real solution for the problem." In a new report titled "Lebanon's Self-Defeating Survival Strategies," the International Crisis Group outlines the way "Lebanon is surviving internal and regional strains remarkably well, but this resilience has become an excuse for tolerating political dysfunction." Some say political delaying tactics — for example, postponing Cabinet meetings when there's a fear that leaders from different sects might disagree about something — have at least kept the country out of the terrible violence roiling the rest of the region. Others point out that a million Syrian refugees who've sought safety in this tiny country are straining its resources. But Atrache thinks that the government's not collapsing is not enough. Failure to deal with the root causes of problems from security to electricity is gradually stoking divisions and anger. She hopes the current outrage over trash will galvanize politicians into governing the country more effectively. "The good thing about garbage is it is affecting them, too," she says. "So I am hoping the political class is really suffering like all other Lebanese."